Evinox are excited to announce the launch of the ModuSat CHHC Combined Heating & Cooling Interface Unit range. Perfect for homes connected to a communal scheme that require both heating and cooling throughout the property. The ModuSat combined heating, hot water and cooling unit provides simultaneous heating and cooling and the instantaneous production of hot water. Designed to simplify apartment installations where cooling and heating is required; the CHHC unit features a small footprint that minimises required cupboard space, with easy access for service and maintenance. The heating, DHW & cooling plate heat exchangers are housed within a single cased unit with high quality fully insulated separation between the hot and chilled zones. 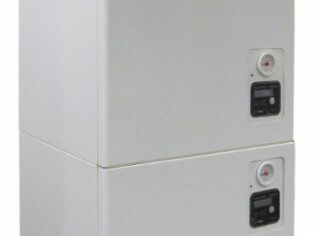 The unit can be provided in either floor standing top connection or wall mounted bottom connection orientations making it suitable for a wide number of installation configurations. The ModuSat CHHC is available with a number of plate size options to meet a range of cooling, heating and DHW requirements and can be supplied complete with a ViewSmart room controller featuring humidity control. Floor standing top connection or wall mounted bottom connection. Simplifies apartment installations where cooling and heating are required simultaneously. Small footprint minimises required cupboard space. SmartTalk™ two-way communication provides remote monitoring, alarms and diagnostics. Pressure Independent Control Valves (PICV) – eliminates the requirement for 3 separate valves for the regulation of differential pressure, flow and heat energy. ViewSmart Room Controller with an optional ENE3 compliant model – provides 2 credits towards the Code for Sustainable Homes. Ready to control 2 heating zones for 2010 Building Regulations. Inbuilt PaySmart pre-payment technology can be activated remotely – no requirement for any additional externally mounted equipment. Evinox combines the expertise and independence to deliver lifetime communal heating packages for any project brief. We provide a complete Communal Heating solution including Central Plant Room Equipment, Modusat Heat Interface Units Service and Maintenance Packages and Energy Metering, Billing and Remote Surveillance.